The immediate side effect of creating sender specific rules is that the space available for storing rules is quickly consumed. You can no longer create more rules. This problem was more common with older versions of Outlook. Tech Talk: The space originally allocated for storing rules was 32KB. It may sound weird but there was a technical reason for it. That was the maximum size of an RPC packet. By limiting the size of the rules storage, the transport performance was optimized. In the newer versions of Exchange, this limit no longer exists. making it even easier to misuse it. What is wrong with creating sender specific rules? This approach was probably good in early days where few people used to send us mail. Now the number of people communicating with you has increased dramatically. It is impractical to have a folder for each common sender. More importantly, there is a fundamental problem here. As you know, Inbox Rule gets applied as soon as the mail arrives in the inbox. This rule MOVES the mail to a completely different folder. Most of us focus on Inbox first. And now you don’t have these type of mails in the Inbox. This forces you to go to multiple folders in search of mails which require your attention… That means you will have to waste more time just to find what is pending. Unfortunately, we don’t even get enough time to finish all pending mails in inbox itself. We are complicating that issue by forcing ourselves to divide the attention across multiple folders. If you really want to know mails coming from a particular person, you can create a search folder. 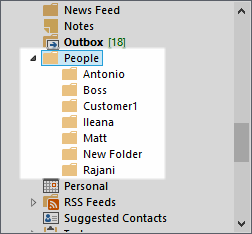 Read Live search in Outlook for more details. Like Excel, Outlook also provides conditional formatting. It is like creating a rule with only ONE possible action – formatting. Using this, you can color code mails by person or use different fonts and formatting. However, if you put too many rules, the inbox is going to look very funny and jarring. Every mail received from one of these special senders is not important. You must respond to important mails first. How is this done? Read this article How to identify important mails automatically? There is a series of articles on Outlook which you can benefit from. Read these as well. This article and next about creating search folders, unfortunately works only on desktop outlook version. It doesn’t give same functionality on phone (I use WP) and Outlook web apps (where it shows color category but you can’t arrange mail on that criteria). So folders seems to be only option if you access your mails on the go. Lot of mass mailing software uses Mail merge facility. My name is in To:, although it is not important, I have to go through it. Right now, I use rule where it checks if subject or body contains word ‘unsubscribe’ it will go to a different folder. (This is not foolproof but routes most of the junk mails) I don’t get barrage of mails in my Inbox on my mobile device. Hi Gaurang. Thanks for posting your thoughts. Let me address it one by one. As far as rules are concerned, server rules will run anyway. Only rules which require some local action like moving mails to a PST require desktop version of Outlook to be open. I am saying DO NOT create person specific rules to route to separate folders automatically. By all means you can read the mails in Inbox and decide to MOVE them manually to any folder you like. If you want them to be available on the go, then you have no choice but to create subfolders in the server mailbox. Otherwise, a PST is fine. Now with Office 365 giving you an unimaginable 25 (or 50) gb space, mailbox getting full is no longer the problem. Therefore, this approach will work. The rule you created for managing spam using unsubscribe is fine. That will mark such mails as junk. The only issue is if you have subscribed to a place intentionally, then it is a problem. Because even those mails will be considered spam. The only option there is to identify genuine senders and add them as exceptions to that rule. My approach is to use flags – which are supported by any mail client on any platform – to indicate that some more sophisticated action needs to be taken when I am using OWA or desktop version. I also use flags to identify mails which are of temporary significance like Boarding Pass, Ticket booking, movie bookings etc. On the mobile I create a view which shows only flagged messages for last 5 days. In the desktop client, I simply ignore the flags. Great. Thanks for response. Now I understood, using these approaches are not either/or, we might use both for desktop and mobile. I will check the flag approach.